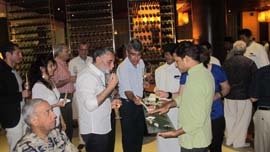 June 27: Umami may be the fifth sense on the palate discovered in Japan a couple of decades ago but the zest to offer this sensation might have inspired the recently launched multi-cuisine up-scale restaurant ‘Ummami’ in Gurgaon where the members of the Delhi Wine Club were treat to a quality Mediterranean gastronomical experience on June 12 , writes Subhash Arora. Siesta India, the owners of this new restaurant may or may not have been inspired by the Zest Restaurant in DLF Emporio in Vasant Kunj, Delhi (now renamed as Set’z due to some legal hassles) but the open styled kitchens, separate counters for Japanese, Italian, Mediterranean, Chinese and Indian cuisine with an expanse of well-laid out tables and a PDR give you the feeling of déjà Vu and remind you of the first time you visited Zest. There is an additional counter where fresh cuts are prepared in front of guests. One has to enter the restaurant practically through the bar which in all likelihood would soon become a wine bar if the wishes of the management come true. 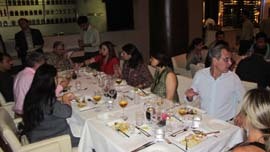 If there were to be a USP for a Delhi Wine Club dinner, the appetizers organized by Mohit Balachandran, Head of Operation of Siesta India were a dream start for the evening which began at the regular Sunday time of 8 pm . There was a buzz in the air since many members had heard about the restaurant and others had been already there recently. The ‘Delhi ‘ members had made a special effort to come- the light Sunday traffic and the curiosity to compare the Gurgaon ‘ Zest’ were attractive enough. The ambience was convivial for the usual bonhomie observed at a close extended family reunion that a DWC wine dinner usually is. A few members might have been tempted by the promised tasting of ‘Cento Uve’ by a Piemonte producer Giribaldi. Made from 152 grape varietals with half being Nebbiolo, they were keen to taste the wine which Arora had taken out from his personal cellar for the member friends. However, the ‘100% compliant’ restaurant politely but firmly refused to let the bottles be carried in despite his plea that it was a mere tasting at a private event (2 bottles for 40 persons) and that the wine had been brought in legally as a part of the baggage allowance. A different interpretation of the excise laws gave the restaurant an upper hand and members had to be content with a rain check. But a rain of aperitifs served with a quaffable Prosecco and a California Chardonnay made people forget about everything else and the bonhomie generated by the 12 delicious starters (it would have to be a club record in this section of the Menu and umm so delicious-mama mia! So thank you, Ummami) set the mood for the evening. Grilled Prawns with pineapple pink peppercorn salsa, Smoked salmon with cream cheese and caper berry and the Galangal river sole triangles with tom yum glaze not only went down well with the pedestrian wines, the limelight was well shared by the Sushi grand-platter carried by two waiters holding it carefully with both hands. Both the vegetarian and shrimp Tempuras, served piping hot kept the members busy demolishing them. It’s just as well that the club encourages an informal atmosphere at such events. Even the vegetarians were spoilt for choice. Members would have happily carried on for a longer period munching and drinking at the wine bar but for the promise of a fine Chardonnay Reserve from a great Chilean producer ready to be served at the table with the nut crumbed red snapper with yellow pepper coulis and tomato compote. This was delicious and though I felt the crust a tad too dry, most members loved this style. Carpaccio of pickled beet, crumbled goat’s cheese, black olive had divided opinion, with more people liking it than loving it. But the wine was disturbingly disappointing. The restaurant had 12 bottles and we had picked up all of them. Barring a couple, all the others were off and the bad aromas and unpleasant flavour of the dead wine were very much in the glass. That most members picked out the wine as ‘off’ might have been encouraging sign that the members could differentiate between the good and the off, but that was no consolation. Worse, the thought that if these bottles had been served to other novices later, the wine world might have perhaps lost 30-40 new entrants for ever; they might not have realized that the wine was bad but the flavour would have put them off for ever- and all because of bad storage at the importer/distributor end. Restaurant would have to take the blame too but apparently they had picked up the stock just a few days ago. We had to take a quick decision and ordered another wine that might not have as many adjectives but saved the day as it was fresh, crisp, simple and quaffable and matched the food. Braised lamb shank, grilled saffron polenta cake and the alternative chicken dish as well as the Ragout of wild mushrooms, Feuillet puff shell and hazelnut salad did well to establish the restaurant’s reputation as a place for a gourmet meal- The Dogajolo 2008, a Super Tuscan from Carpineto in the Chianti Classico area also helped. This wine was fresh, fruity with lots of cherries on the mouth, fairly elegant and long-ended. Members refused to get up even after polishing off the desserts trio-a Crème Brulée, an excellent Belgian dark chocolate mousse and a Kalakand of fresh watermelon, till the last drop of the Super Tuscan available at the restaurant was finished. Ummami Restaurant is very well located on the DLF Golf Course road in Gurgaon and is easily accessible even from Delhi at the times one can avoid traffic on MG Road. It is a promising destination for gourmet food with a wide choice for the family; according to Mohit the Indian food is finger-lickin’ good and is their specialty. It will also make an excellent wine bar but the management will have to strictly ensure that the bottles have enjoyed proper storage, a factor that almost threw our wine dinner in a spin. Although the staff went in a tizzy trying to open the Chardonnay bottles apparently with dry and crumbling cork (this ought to have sent the first SOS signals), the service does need to improve and a better co-ordination among the waiting staff would be helpful- perhaps the members of the Delhi Wine Club have been too spoilt by the dream service of hotels like the Hyatt Regency, Claridges and the Leela. One finds it difficult to accept any slack in service, though we like to grant concession because of pre-plated dinners of such large numbers-all at the same time is not an easy job. 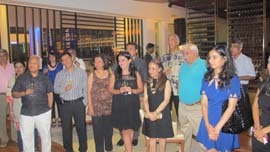 On the whole, it was a very interesting experience, certainly worth repeating as a wine tasting evening with the rain of their wide range of excellent aperitifs or with another cuisine next time. Special thanks to the special guests, Ambassador of Portugal, H.E. 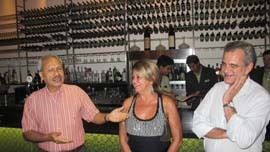 Jorge Oliveira and his lovely wife Maria for attending the dinner.